Dracula was a demon, the Invisible Man a maniac, and Gill-man a literal monster. The Mummy killed to possess, the Wolf Man for lack of control. But Frankenstein’s Monster killed for the simple reason than he didn’t know any better. Therein lies the essential truth of James Whale’s Frankenstein: it is a Horror Film if you sympathize with the Doctor but a Tragedy if you sympathize with the Monster. Based on the landmark novel by Mary Shelley, Frankenstein follows the experiments of Heinrich Frankenstein, a young scientist whose ambition is matched only by his audacity. For Herr Frankenstein wishes to conquer the realm of death by literally creating a human being. Pilfering graveyards and universities, Frankenstein patches together bits and pieces of different corpses into an unholy amalgam galvanized into consciousness. 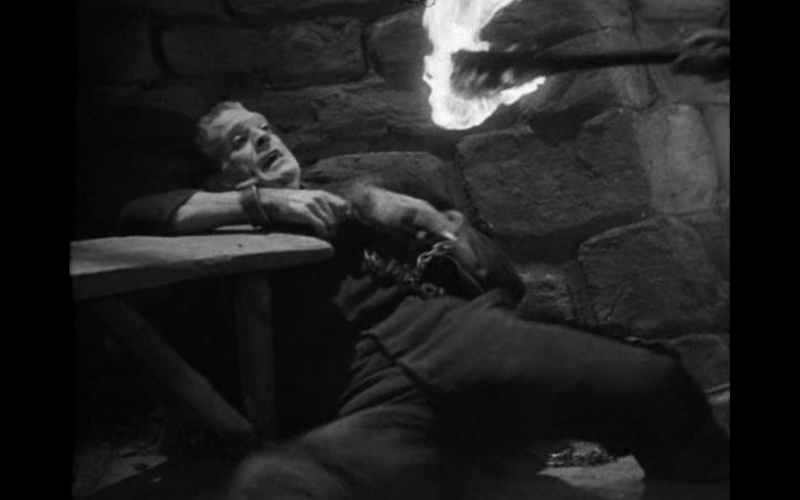 But the accidental inclusion of an abnormal brain makes Frankenstein’s Monster violent and uncontrollable. Escaping from the watch tower where he had been “born,” the Monster stumbles through the countryside leaving a trail of confusion, terror, and death. 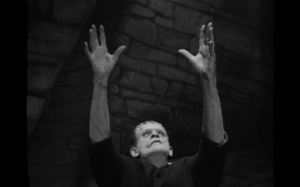 Since its release in 1931, Frankenstein has achieved the rank of cultural touchstone. Its imagery and storyline have become so ingrained in the popular consciousness that it exists alongside films like Casablanca (1942) and The Godfather (1972) as works that the general public is intimately familiar with even, if not especially, among those who have never actually seen them. And yet many would be astonished to learn just how different Whale’s film is from Shelley’s original novel. Gone is the tedious framing story of Captain Walton and his Arctic expedition. Whereas the novel travels throughout Europe and charts Herr Frankenstein’s life from his childhood through to his education and finally to his death, Whale’s film utilized a singularity of setting (the Bavarian countryside) and characterization for the scientist. 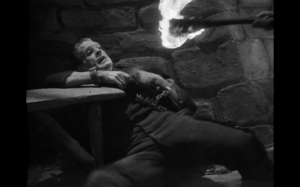 Indeed, the audience is even cheated of the resolution of Herr Frankenstein’s character arc: we are informed of his survival and imminent recovery from being attacked by his creation by a supporting character in an unusually disingenuous epilogue. But the most radical departure from Shelley’s novel is the Monster itself. The Monster’s electrical nascence at the hands of nightmarish machinery was an invention of Whale and legendary set designer/special effects creator Kenneth Strickfaden (Shelley’s Monster had been birthed from an unspecified combination of chemistry and alchemy). Shelley’s Monster was intelligent and articulate, capable of learning and speaking several different languages. Whale’s Monster, played by Boris Karloff in a performance that would define and immortalize him, is a confused child in the body of a giant. While both Monsters are tragic figures thrust into an uncaring world, Shelley’s Monster develops into a malevolent rogue who almost gleefully murders Herr Frankenstein’s friends and family when he refuses to construct him a wife. Whale’s Monster kills out of ignorance. The unforgettable scene where the Monster accidentally drowns a little girl because he thinks that she will float highlights his naive, destructive innocence. When Shelley’s Monster destroys himself, it is justice. But the annihilation of Whale’s Monster in a burning windmill by a rabid mob of villagers (a climax which was another one of the film’s inventions) marks him as just another victim. Though not the most technically polished of the Universal Monster movies, Frankenstein remains fresh where many of its contemporaries have since aged. Perhaps that is because the human tragedy of Frankenstein’s Monster is so palpable. He is created, imprisoned, hated, and destroyed first by the whims of a mad scientist and then by the command of an angry horde of strangers. His brief existence is dominated by a search for meaning and perhaps even love in the face of a cruel world. 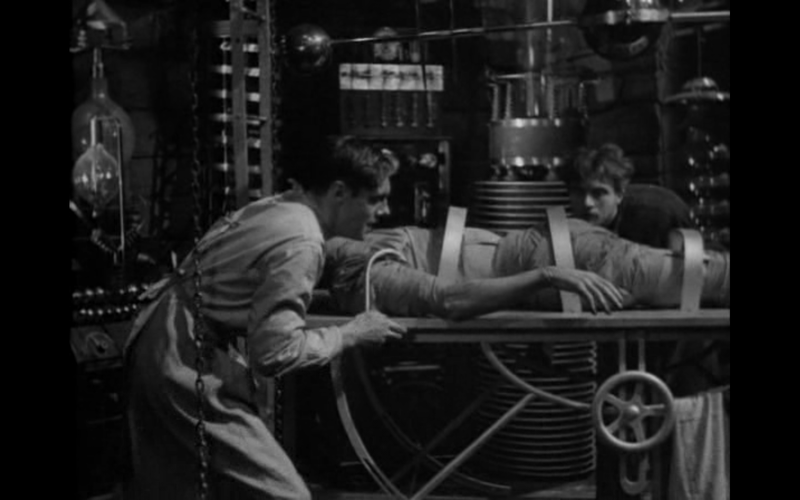 The most iconic scene of the film is when the Monster is jolted to life on top of an operating table in a sinister lab. But the most important is the Monster reaching, reaching for a ray of sunlight spilling down from the ceiling into his cell.